When was the last time we saw Madea? Was she in jail? I don't recall. 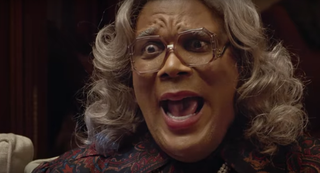 But this fall, Tyler Perry will be back with another Madea movie, and this time she might just get the bejesus scared right out of her. Perry's Boo! A Madea Halloween is filled with every horror trope you could possibly imagine, but with Perry's personal touch, of course. In the trailer, I lost count of how many characters Perry is playing, but it's sure to get a few laughs, if that's your thing.